Left to right: Patty Reinhart, Andrew Ceglio, Mohammed Ismail. Photo courtesy Joyce Goldschmid and Palo Alto Players. One of the long-forgotten traditions of the American theatre is the vaudeville circuit, where you could watch music and comedy on a local stage for dirt cheap. No group was more notable for vaudeville than the legendary Marx Brothers, whose hilarious and incredibly-crafted wordplay informs comedy writers to this day. Palo Alto Players’ performance of the 1979 adaptation A Day in Hollywood/A Night in the Ukraine hearkens back to the vaudeville stage, first with several musical numbers from an outstanding ensemble cast, then with a Marx Brothers performance that packs their hallmark brand of comedy into a tight hour of Chekhov-inspired comedy. The first hour of Hollywood/Ukraine is a musical revue presented under the thin veneer of ushers at Grauman’s Chinese Theatre attempting to distract the audience while the projectionist tries to get the movie going. The most fun one, “I Love a Film Cliché,” collects the premiere lines of 1930s cinema at a rapid pace and making use of the numerous balconies and corridors of the Lucie Stern theatre. Other numbers include a tap dance accompanied by a verbatim reading of the 1930 Motion Picture Production Code and a tribute medley to composer Richard Whiting, best known for the classic song “Good Ship Lollipop.” The Day in Hollywood section is hilarious, of course, but it also evokes the more innocent, straightforward films of the early 20th century in a way that’s almost nostalgic. Night at the Ukraine features three Marx Brothers impersonators stumbling, in a fashion unique to the Marxes, through the obscure Chekhov one-act play The Bear. When performing a Marx Brothers show, strict adherence to the character is key, and all of the actors do a bang-up job. Andrew Ceglio’s Groucho is almost a perfect reenactment, flawlessly accomplishing the rapid-fire wordplay and acrobatic pratfalls necessitated by the role. Chico, played by Mohammed Ismail, is a little lower-energy than Groucho but neatly balances the mix of cleverness and stupidity that every Chico character requires. Last but not least, Patty Reinhart delivers Harpo’s series of physical gags without missing a beat. Reinhart is significantly shorter than her partners in crime (and the actual Harpo), which actually works well for her role – high-energy comedy is especially funny when delivered by someone smaller than everyone else. Also of note in Night at the Ukraine is Sarah Cook as Mrs. Pavlenko, the resident high-class large woman present in every Marx Brothers comedy. Pavlenko acts as the play’s straight performer, mirroring Groucho’s wordplay and Chico’s props with equal amounts of horror, and helps both ground the play in some semblance of reality and present the small amount of plot the Marx Brothers need to get away with making a series of jokes for an hour. Cook mirrors the energy of Ceglio, Ismail, and Reinhart so they don’t run away with the show while not overshadowing the comedy – an excellent performance. Some of the play’s technical work is more functional than spectacular (as necessary for comedy), but there are several small touches that deserve attention. The ensemble, dressed as ushers, welcomes in the audience at the start of the production; this touch of metatheatre blends the performance of Palo Alto Players with the dreamy cinematic reality of old Hollywood. Patrick Klein’s set during the first act captures much of the same feeling; the famous sidewalk outside Grauman’s is set very high on the stage, twisting around dimensions that might be familiar to moviegoers. Piano work by Katie Coleman and Lauren F. Bevilacqua ties the production together and allows the vocal performers to shine. While there are a lot of excellent dramas present in the American theatre today, a good comedy is hard to find. A Day in Hollywood/A Night in the Ukraine is one of those good comedies, capturing the best wordplay and physical humor of the era of vaudeville. 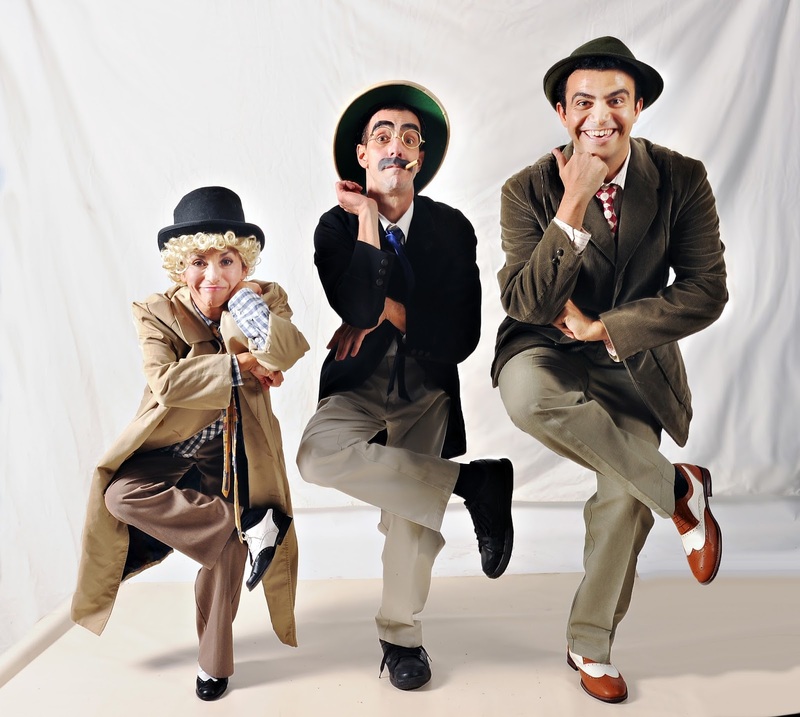 If you want to have a fun night out with the Marx Brothers, stop by Palo Alto Players – they’re always better live.